DOUBLE YOUR IMPACT WHEN YOU HOST A PARTY! ASK YOUR CONSULTANT FOR DETAILS. *Donation made on Customer Specials purchased from noon, CDT, October 1 to noon, CDT, November 1, 2018. 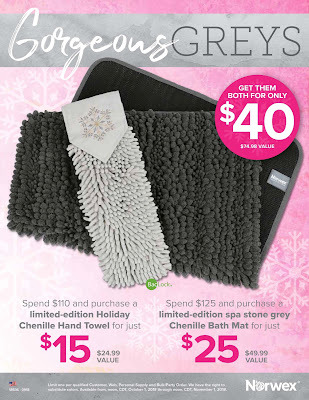 **Spend & Get: Limit one per qualified Customer, Web, Personal Supply and Bulk/Party Order. We have the right to substitute colors. Orders must be submitted to the Home Office from noon, CDT, October 1, 2018 through noon, CDT, November 1, 2018. ‡Customer Specials: Orders must be submitted to the Home Office from noon, CDT, October 1, 2018 through noon, CDT, November 1, 2018. Products and colors in packages are predetermined and may vary based on inventory availability. 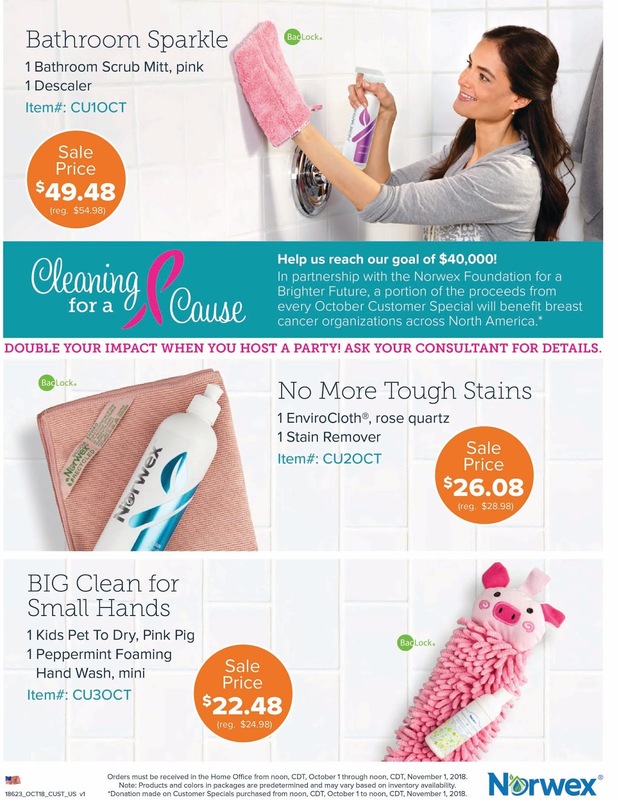 Join us in the ght against breast cancer by Cleaning for a Cause! We’ve teamed up with the Norwex Foundation for a Brighter Future to donate $1 for every qualifying party ($350 in Subtotal A Sales, 3 Buying Guest and 1 Booking) held in October to breast cancer organizations across North America. **Host Exclusive: A qualifying party is a party with $650 in Guest Sales, six Buying Guests and one Booking. To qualify, sales must be submitted to the Home Office from noon, CDT, October 1, 2018 through noon, CDT, November 1, 2018. To qualify for October Specials, sales must be submitted to the Home Office from noon, CDT, October 1, 2018, through noon, CDT, November 1, 2018.